Before you know it, summer will have come and went and cooler weather will arrive in Gulf Shores, AL. And, if you're like us, you know that means it's about time to head to the Gulf Shores Golf Club for a round (or two!) of golf. Gulf Shores Golf Club is one of the best golf courses on the Alabama coast. With a challenging course and elegant clubhouse, this championship course is a golfers dream. This fall, you need to plan a golf trip and the Gulf Shores Golf Club should be the first course on your list. Find out more about all of the fun things to do in Gulf Shores when you download our free Vacation Guide. It's full of the best recommendations for things to see and do like enjoying a day at the Gulf Shores Golf Club. One of the best things about the Gulf Shores Golf Club is that the club welcomes both golf enthusiasts and novice players. No matter your skill level, the knowledgeable and friendly staff at the club will always help you arrange a perfect day on the links. In addition, the club has rental clubs available, a full-service bar and grille, and a well-equipped pro shop that will cater to your every need. And, for visitors who'd like to take a golf lesson in Gulf Shores, there is a PGA professional available on site! 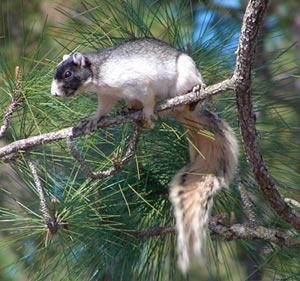 Eastern Fox Squirrel photo taken by Dr Skip. You might see him while you are playing golf at the Gulf Shores Golf Club. Once you've set a tee-time and arrive at the Gulf Shores Golf Club, you will have exclusive access to a variety of practice facilities. These facilities are reserved for club members and registered players only. When you warm up before a round, you won't have to fight for space at the driving range, practice putting green, chipping green, or surrounding sand bunkers. Plus, your green fee at the Gulf Shores Golf Club always includes a golf cart for the day and range balls to use before you tee off. While the practice facilities at Gulf Shores Golf Club are exceptional, the 18 hole championship course is even better. Gulf Shores Golf Club is one of the top 10 courses in Alabama and has a 97% rating from golfers who have played the course. Originally built in the 1960's, the Gulf Shores Golf Club was the first golf course in the area. In 2005, the course was extensively renovated and now includes many water features, enhanced fairways, and additional bunkers. You will also see water hazards, numerous oak and pine trees, and an abundance of wildlife on the course. Another reason you need to visit Gulf Shores Golf Club is the seasonal specials offered at the club. Often times, groups of two or more can receive a reduced rate, especially if they book an afternoon tee time. And, large groups of 12 are more are eligible for even better pricing. If you are a serious golfer who will make several Gulf Shores golfing trip this year, you should also ask about the 6-pack special. With this special, you can prepay for 6 rounds of golf at the club and will receive a reduced rate! Don't wait until all the best vacation homes are spoken for. Start planning your Gulf Shores gulf holiday today! We offer a great select of beachfront vacation rentals with luxury amenities.